The drive unit is very compact, requiring very little floor space. The simple drive unit has only one moving part, resulting in very low maintenance and long life. The massive gearbox is belt-driven by a standard 2HP motor. Choose to run the 1/2" diameter Dura-Chain on top of existing floors or in a groove. 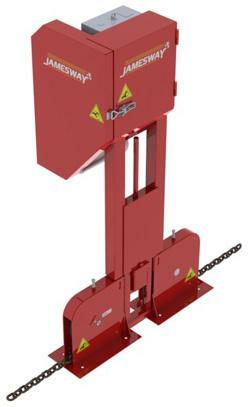 Up to 1,000 feet of chain may run on a single drive unit. Used in smaller to medium sized barns, the XD-260 has a 26" diameter drum, giving a maximum stroke of 230 feet using 3/8" cable or 165 feet using 1/2" cable. The 18" wide drum is 1/4" thick and runs on pillow block bearings. The #80 roller chain on the drum is powered by a standard-duty gearbox featuring a self-aligning outboard bearing to handle heavy loads. Used in medium to large sized barns, the XD-480 has a 48" diameter drum, giving a maximum stroke of 440 feet using 3/8" cable, or 350 feet using 7/16" cable or 325 feet using 1/2" cable. The XD-480 is recommended for barns up to 650 feet long using 2 blades per alley. The 18" wide drum is 5/16" thick and runs on heavy duty cast flange bearings. The #80 roller chain on the drum is powered by a super-duty gearbox able to handle the heaviest loads. For use in the largest barns, everything about the XD-600 is massive. The 60" diameter drum is extra wide (24"), giving a maximum stroke of 600 feet using 1/2" cable, allowing this heavyweight to clean barns up to 2,350 feet long! The 3/8" thick 60" drum runs on heavy duty cast flange bearings, powered by a #100 roller chain running on our massive super-duty gearbox.